Mr. Ban said there are many U.N. colleagues unaccounted for in the rubble, among them, the head of the mission, long-time U.N. official, Hedi Annabi, and his deputy Luiz Carlos da Costa. U.N. Secretary-General Ban Ki-moon says more than 100 U.N. personnel are missing in Haiti and the organization is assessing the damage from the powerful earthquake that rocked the country Tuesday. Mr. Ban said he is dispatching a senior U.N. official to Haiti and is immediately releasing $10 million in emergency assistance. A somber U.N. chief told reporters the earthquake devastated the capital, Port-au-Prince, which has a population of nearly 3 million. But he said other areas of the country appear to be largely unaffected. "We are yet to establish a number of dead or injured, which we feel, may well be in the hundreds," said Mr. Ban. "Medical facilities have been inundated with injured. There is no doubt we are facing a major humanitarian emergency and that a major relief effort will be required." The United Nations has more than 9,000 peacekeeping troops and police in Haiti, and an additional 1,900 civilian personnel. The main U.N. headquarters at the Hotel Christopher collapsed Tuesday, but the mission's main logistics base is in intact. 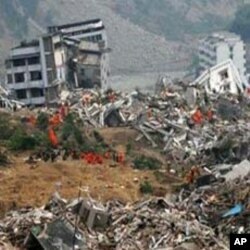 Mr. Annabi was meeting with a delegation of Chinese police officials at the time of the quake. U.N. officials say the members of that delegation are also unaccounted for. Peacekeeping Chief Alain LeRoy said the United Nations is working to learn the fate of the missing U.N. personnel. "As we speak there are still over 100 people unaccounted for under the rubble," he said. "We do not know about their fate. To your question, some people have been extracted out of the building - but only less than 10 for the time being. Some dead, some alive. So we do not know for the time being the fate of the others. But of course, we are extremely, extremely concerned." Humanitarian Chief John Holmes said the main need now is for search and rescue teams with heavy lifting equipment, as well as for medical personnel and supplies. Peacekeepers are working to clear the roads to assist those teams. The U.N. is also sending a humanitarian emergency response team to prepare for a massive assistance mission. Holmes added that U.N. supplies in Haiti will not last very long and more aid is being brought from warehouses in the region and beyond. Former U.S. President Bill Clinton, who is the U.N.'s Special Envoy on Haiti, is to meet the Secretary-General at U.N. headquarters Wednesday afternoon to discuss the situation. Mr. Ban is also dispatching Edmond Mulet, the deputy peacekeeping chief, who has previously served as the U.N.'s top diplomat in Haiti. He is expected to leave for the island Wednesday night to take command of the U.N. operation there. On a positive note, officials said the airport is currently "fully operational". But it is clear that many important buildings have collapsed or are damaged, including the Presidential Palace, the National Assembly, several ministries, the national prison and the Montana Hotel. The U.N. General Assembly is convening an emergency session Wednesday afternoon, where the secretary-general will brief them on the latest developments.